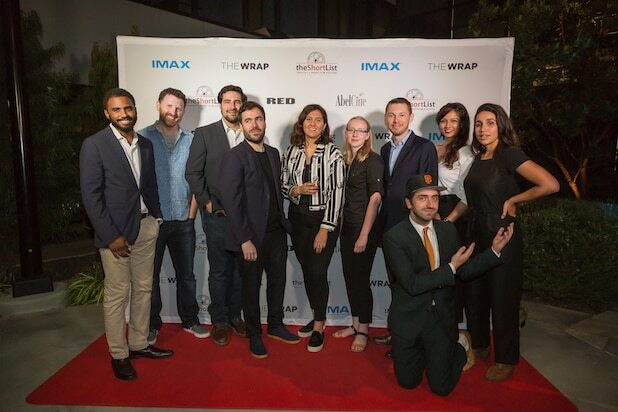 Pictured here are the 10 of the finalists in TheWrap's sixth annual ShortList Film Festival. Waxman hosts a panel with jury members Stephen Ujlaki, Lesley Chilcott, Alec Shankman, Lisa Bunnell, Misha Green, Matt Ross and Ryan Heller. Juror Misha Green speaks on what makes a good short film. 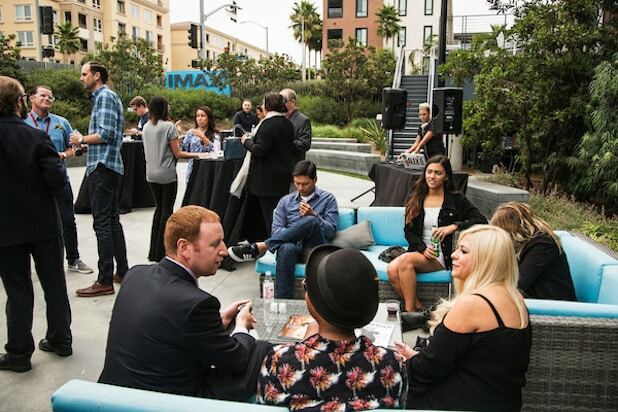 TheWrap's Sharon Waxman and ShortList finalists Ceylon Carhoglu, Daniel LaFrentz, Benoit Martin and Joe Talbot discuss budgeting short films. Tim Mason, director of "No Other Way to Say It"
Ceylan Carhoglu, co-director of "Gardeners of the Forest"
Filmmaker Garrett Bradley ("Alone") speaking. "GLOW" actresses Rebecca Johnson and Kimmy Gatewood announce winners of the ShortList Audience Prizes. Rebecca Johnson and Kimmy Gatewood stand with student Audience Prize winner, Uttera Singh ("Fanny Pack"). "Fanny Pack" director Uttera Singh accepts the student Audience Prize. Rebecca Johnson and Kimmy Gatewood stand with Audience Prize winner, Joe Talbot ("American Paradise"). "American Paradise" director Joe Talbot accepts the Audience Prize. Audience Prize winner Joe Talbot ("American Paradise") and Student Category winner Uttera Singh ("Fanny Pack") pose with TheWrap's Steve Pond. Ceylan Carhoglu and Alberto De Coste Calla, co-directors of "Gardeners of the Forest"
TheWrap's Sharon Waxman snaps a selfie with student finalist, Quran Squire (“Curiosities of the Quiet Boy”). TheWrap's Steve Pond and juror Matt Ross. TheWrap's Matt Turner snaps a photo of "GLOW" actresses Rebecca Johnson and Kimmy Gatewood. Student finalist Bethany Spreadborough, director of "This Year's Angel"
Finalist Tian Xie, director of "Promise"
Lisa Bunnell and Matt Ross present an award. Joe Talbot accepting the award for his film. Student finalist Quran Squire ("Curiosities of the Quiet Boy"), and the lead actor in Joe Talbot's "American Paradise"